Drunk driving is problem all year-round, but it’s an especially big problem over holiday periods. 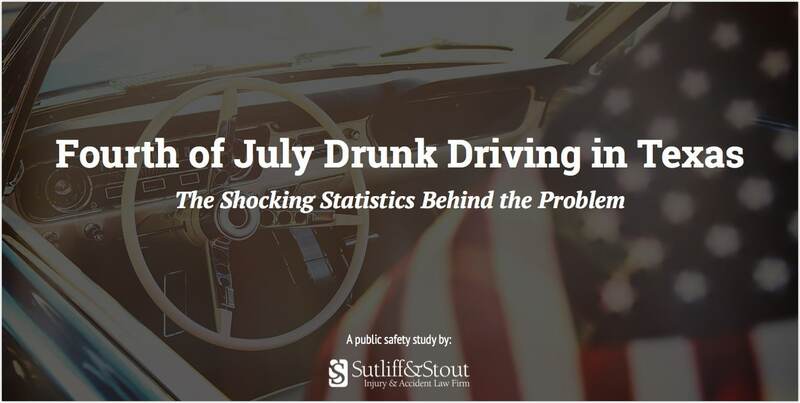 With the Fourth of July right around the corner, our Houston auto accident attorneys decided to examine Texas crash data to see whether, and to what extent, there is an increase in drunk driving crashes, injuries, and deaths over Independence Day. The results of our research is below. For complete details on the methodology used to gather and analyze this data, click here. Not surprisingly, Texas’s largest cities are also home to the most crashes involving drunk drivers. 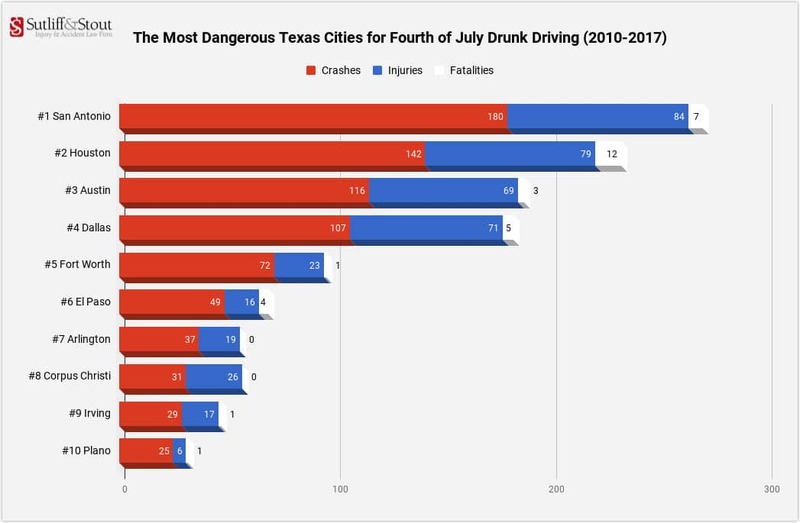 The chart below ranks the 10 Texas cities which have had the largest number of crashes, deaths, and fatalities caused by drunk driving on the Fourth of July over the past 8 years. 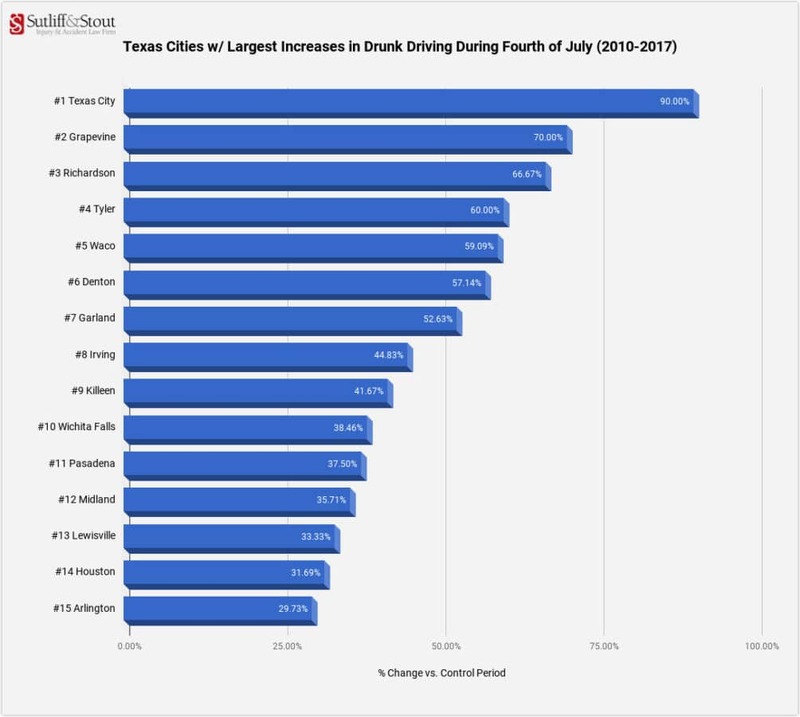 While it’s somewhat obvious that Texas’s largest cities will see the largest increases in total drunk driving incidents over the Fourth of July, it’s useful to look also at which cities see the largest percentage of increases in drunk driving. Next, let’s look at the changes in drunk driving across Texas’s five largest cities: Houston, San Antonio, Dallas, Austin, and Fort Worth. Houston experiences the largest increases in both total drunk driving crashes (+31.69%) and fatalities (+75.00%) of any of the five largest cities. San Antonio experiences the largest increase total injuries (+48.81%) of any of the five largest cities. Fort Worth experiences the largest increase incapacitating injuries (+83.33%) of any of the five largest cities. Dallas is the only city of these that has not seen an increase in drunk driving crashes during the Fourth of July over the past eight years. This begs the question: What is Dallas doing right? The data speaks for itself. While drunk driving is always an serious problem, it is especially so over holidays like the Fourth of July. If you celebrate Independence Day by having a few cold ones with friends and family, make the smart decision and arrange a sober ride home. If you’re in Houston or Austin, be sure to take advantage of our No DWI Free Holiday Rides program. If you’re elsewhere, take a cab, an Uber or Lyft, or arrange for a designated driver. In conducting our study, we used the Texas Department of Transportation definition of alcohol involved crashes, which is a crash where any person reported with a contributing factor of Under the Influence of Alcohol, or Had Been Drinking, or test results with a blood alcohol content of greater than 0. Using TxDOT CRIS Query System, we gathered crash data from the past eight years (2010–2017) for Alcohol Involved Crashes during the Fourth of July. We didn’t just look at data from July 4th; rather, we gathered data for the day before the holiday (the 3rd), the day of the holiday, and the day after the holiday (the 5th). We then gathered the same data for the same three day period, but for the week after the Fourth of July holiday. This data serves as the control. This allowed us to compare alcohol involved crashes over the holiday period with alcohol involved crashes during a typical non-holiday period.